Gentian (Gentiana) - Dwarf evergreen alpine plants, some of them difficult to cultivate, but others easily grown (on the rock garden and in borders). The most precious are the perennial alpine kinds, which are such a beautiful feature on the mountains of Europe, and with care in our gardens spread into healthy tufts and flower as well as on the mountains. Gentianella (Gentiana Acaulis) - An old inhabitant of English gardens, and among the most beautiful of the Gentians. It is easily cultivated, except on very dry soils. In some soils edgings are made of it, which, when the plant is in flower, are of great beauty. It is at home on the rock garden, where there are good masses of moist loam in which it can root. 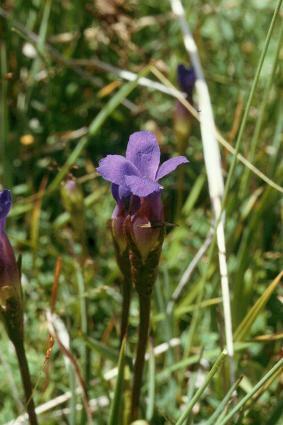 With us the flowers open in spring and in early summer, but on its native hills they open according to position, like the Vernal Gentian. G. alpina is a marked variety with small broad leaves, and there are several other varieties. Their colors vary from the deepest blue to white, and in one white flower the tips of the corolla are a rich blue. In all the forms, except the white, the throat of the corolla is spotted with blue on a greenish ground, and all have greenish marks on the outside. Alps and Pyrenees. Willow Gentian (Gentiana Asclepiadea) - A good herbaceous kind, this gives no trouble, but dies down out of harms way in winter. Well grown, it will spring up to 2 feet, and freely produce good-sized flowers of a purple-blue along nearly the whole stem in late summer and autumn. This Gentian will grow in open woods. It may therefore be naturalised, and its effect among the grass in a wood is charming. There is a white form. It is freely increased from seeds and by division. Europe. Bavarian Gentian (Gentiana Bavarica) - In size this resembles the Vernal Gentian, but it has smaller Box-like leaves of yellowish-green, and its tiny stems are thickly clothed with dense little tufts of foliage, from which arise flowers of lovely iridescent blue. While G. verna is found on dry ground, or on ground not over-flowed by water, G. bavarica is in perfection in boggy spots, by some little rill. We must imitate these conditions if we desire to succeed, and a moist peat or bog bed, with no coarse plants near, will enable us to grow this lovely plant. Alps. Gentiana Farreri - A novelty of great beauty and importance from China, having affinity with G. sino-ornata. It forms spreading masses, the stems furnished with long linear leaves and terminated by flowers of the largest size-surpassing those of G. acaulis in this respect-and of the most beautiful sky-blue imaginable. The tube is white. Peat and sandy loam, with moisture in full sun. Cuttings made of the young shoots root readily, and soon make plants. September. Gentiana Freyniana - A beautiful and amiably disposed species of the easiest cultivation, and very free flowering. The flowers, which appear in July and August in terminal club-like clusters on foot-high stems, are of intense indigo blue. Firstrate in every way. Seeds. Gentiana Lagodechiana - A sub-prostrate growing species having probably affinity with G. septemfida, of which it may be said to be a vigorous form. It quickly forms foot-wide masses of semi-procumbent stems, thickly furnished with small glossy green leaves, and terminated by clusters of brilliant blue white-throated flowers, whose lobes are copiously freckled with white. Best in deep sandy loam. No species is more easily cultivated. August and September. Increased by seeds. Crested Gentian (Gentiana Septemfida) - A lovely plant, bearing on stems 6 to 12 inches high clusters of cylindrical flowers, widening towards the mouth and a beautiful blue-white inside, and greenish-brown outside, having between each of the larger segments one smaller and finely cut. In the variety cordifolia leaves are more cordate, but it grows about only half the height of the type, with a much neater habit, and there is a dwarf form. Best in moist sandy peat. The finest of all is the variety latifolia. All are of sub-prostrate habit, flowering in August and September. Seeds. Caucasus. Gentiana Sino-Ornata - The advent of this autumn-flowering species enriched our gardens, it having proved of more facile cultivation than the Himalayan ornata or the earlier introduced Veitchiana. Flowers rich blue. Peat and sandy loam, with moisture in full sun. Readily increased by cuttings. September and October. Vernal Gentian (Gentiana Verna) - One of the most beautiful of alpine flowers, thriving in deep sandy loam, with abundance of water during the warm and dry months, and perfect exposure to the sun. The absence of these conditions is a frequent cause of failure. It thrives wild in cool pastures and uplands, where it is rarely subjected to such drought as it is in a parched border. Grit or broken limestone may be mingled with the soil; if there be plenty of sand this is not essential; a few pieces half buried in the ground will tend to prevent evaporation and guard the plant till it has taken root. It is so dwarf that if weeds be allowed to grow round it they soon injure it, and tall plants overshadow or overrun it. It is abundant in mountain pastures on the Alps, in Asia, and also in Britain. G. V. Angulosa, with winged calyx, has flowers almost twice as large as the type and equally brilliant, while it is of the easiest cultivation. Its requirements are the same, and it may be raised by hundreds from seeds, if these are sown practically as soon as ripe. No alpine merits the attention of the cultivator more than this.